Trench breakers are primarily used in the pipeline industry to control erosion. When laying pipeline you are often at an incline that can cause erosion of the land and compromise the integrity of the actual pipes. Our polyurethane foam trench breakers offer many advantages that far outweigh the traditional sandbag approach. 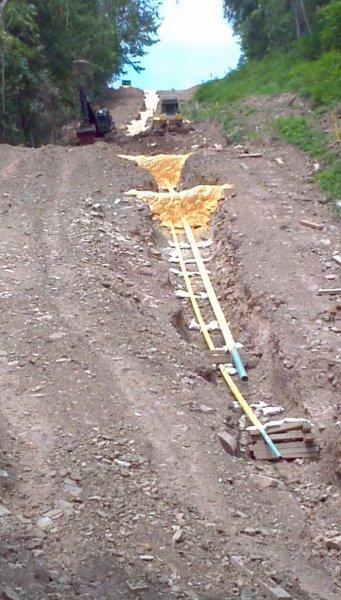 Using the foam trench breakers keep the ditch lines and hill slides in place. The breakers form a complete seal and divert the water in subsurface environments in a way that sandbags never will. They do not rot or breakdown when covered with soil, and they are less labor intensive than sandbags, which in turn reduce the cost of upkeep and maintenance over the years. In keeping with OSHA’s requirements regarding safety around excavations, having the ability to spray from a distance alleviates the concern of cave ins and without compromising the crews safety. Foam trench breakers reduce overhead costs as well. Typically this can be managed by a two person crew which reduces labor costs and speeds up the construction process because of reduced down time. Pillow Pads are an inexpensive alternative to sandbags. They are used to shield the pipe from being positioned directly on rock or other hard surfaces, protecting the coating from damage. Pillow pads can be customized to fit different size pipe and are designed to support the pipe and prevent erosion of the backfill. These pillow pads do not compromise the crew’s safety since the employees will remain out of the ditch. The pillow pads compress and conform to the pipe with a weight load whereas sandbags can actually dent the pipe. Using pillow pads reduce the transportation costs to the job site. They are lightweight and easy to handle too. Since we use polyurethane foam, these pads can be sprayed in place at the job site or pre-manufactured. 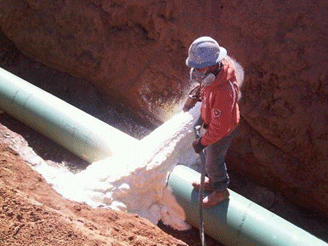 Click here to read an article published in Pipeline Intelligence about All Seasons Foam.